Looking for replacement window parts to repair a Carpenter Bus Body? We know Carpenter buses from front to back and we can supply what you require. 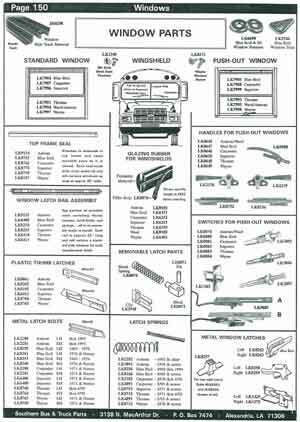 Over the years, Carpenter Bus Window Parts changed and evolved as improvements were made. Carpenter used (5) different types of window sash assemblies....each type having its own thumb latches, push-out window handles, glass, and frame parts. We still have many of these Carpenter window parts in stock, and we can help you find what you need. Metal latch bolts are no longer available. Carpenter bodies with steel framed windows were built through 1971. This type latch is extremely rare and was used with steel frames only. We have just a few of these latches in stock. 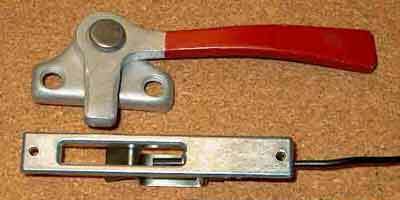 Carpenter offered windows with aluminum frames (using this type latch) beginning in 1969 as optional equipment. When the steel sash was phased out in 1971, this latch became standard. Carpenter used these window parts for about 24-years without any changes. These "black" latches used a small Block and Pin retainer system that allowed easy latch change. These "white" latches also used a small Block and Pin retainer system. However, the switch still is available.